A simple addition of a slide-out section gives the Topaz CV7656SL the added benefit of more space. NZMCD takes a look at this latest offering by Avida. Avida caravans look quite different from other caravans seen on New Zealand roads. 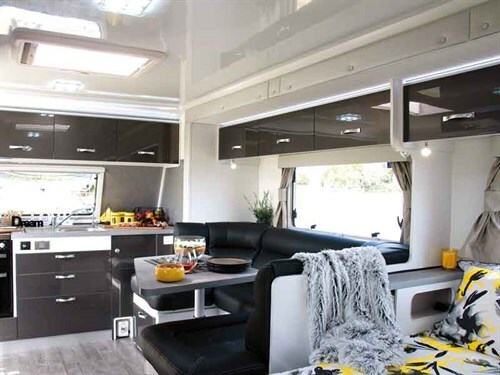 They produce modern and sleek-looking caravans with a front panel shaped like a bullet train. Even sitting still, it appears to be going fast, which is at odds with it being mounted on a high-tech galvanised steel chassis, without a skirt in sight to offer a modicum of modesty. It provoked an internal argument on aesthetics versus practicality, and in the end, practicality won hands-down. 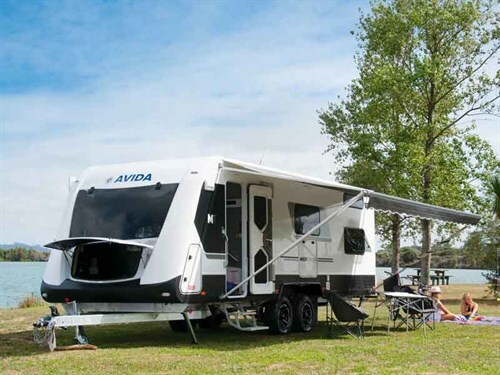 Avida has two caravan ranges: the entry-level Emerald that offers five layouts and the Topaz with six layouts. In both ranges, a lounge seat alternative to the dinette is available. 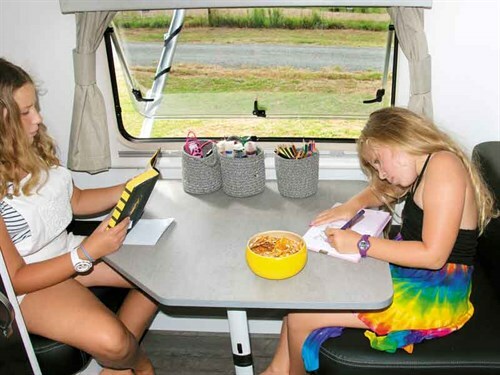 And in the CV7656SL, further choices must be made—either two or three bunk beds or the dinette/two bunk bed option like the one fitted to the caravan being reviewed. 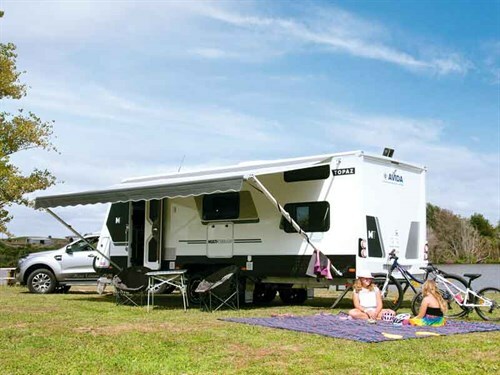 But the standout feature offered by Avida caravans is that seven of the 12 layouts available include a slide-out section. This feature makes more floor space available inside the caravan, and it raises the question of why the feature hasn’t been offered sooner? 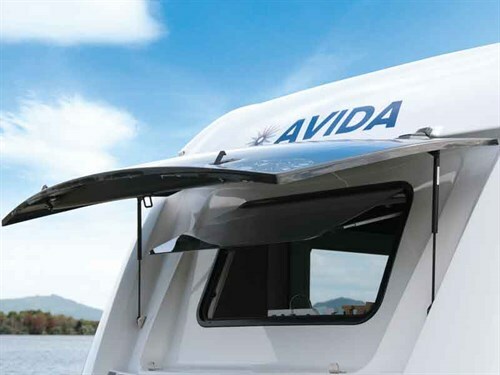 The galvanised steel chassis that is so evident is designed and engineered by Avida. Built to accommodate the Cruisemaster CRS independent suspension system, the design is axle-free and clear of obstruction from front to back. Although it has excellent ground clearance, the underside of the floor is still sheathed in aluminium for added protection. Braking is electric and the AL-KO ESC anti-sway system is fitted as standard. If the Multi-Terrain package option is chosen, as it was for the caravan being reviewed, it includes a Hitchmaster DO35 tow pin and gimballed tow-hitch—a must-have feature if towing across uneven ground. And in case you are wondering, the spare wheel is carried underneath the caravan. Across the front of the caravan is what appears to be a dark acrylic window. It is, in fact, a travel protector covering a smaller window beneath. Once unclipped, the protector lifts easily, with gas strut assistance, to become an effective, solid rain/sun awning. A lot of thought has gone into the front boot. It has a sturdy gas strut ‘lift-assist’ lid with good seals to keep out dust and rain, and all internal seams are expertly sealed. The left side of the boot is devoted to the Truma water heater and the ‘Shurflo’ water pump, both items firmly mounted and easily serviced. The kerbside end is partitioned off to create a 2x9kg LPG bottle locker accessed through a separate door on the side of the caravan. The bulk of the boot space is clear and unencumbered. 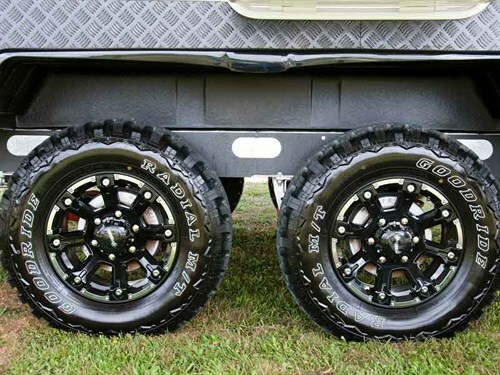 The Multi-Terrain package also provides the black checker-plate protective panels down each side of the caravan and black alloy wheels wearing larger 235/75R15 tyres. 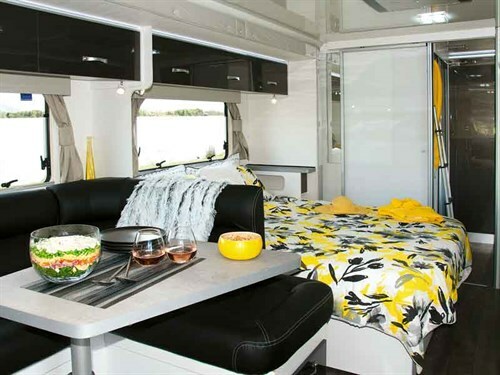 The five-metre rollout awning is part of the standard package as is the exterior entertainment unit. Located under the awning, it provides power points, speakers, and an alternative-mounting bracket for the second smaller TV usually mounted inside. The 2x100amp/hr house batteries are housed in their own locker with the ‘BatteryPlus35’ battery management controller. Alongside are the control boxes for the caravan breakaway system and the slide-out. The first time you enter the Topaz, don’t be surprised if you just stop and stare. If you thought it was different outside, it is definitely different inside. First of all, the slide-out creates a lot more space. Everything is king-sized—the long (2290mm) kitchen bench, the jumbo-sized dinette and the (queen-size) bed. And 2030mm of headroom adds to the spacious impression. Then there’s the light and colour. It is a gleaming bright assault on the senses. Gloss-coloured cabinet doors—in this case Graphite—white walls and ceiling, and light grey ‘Concrete’ bench and table-tops. Even the texture of the tops is reminiscent of concrete. Not a millimetre of timber laminate to be seen in this example (but it is an option if that is your preference. 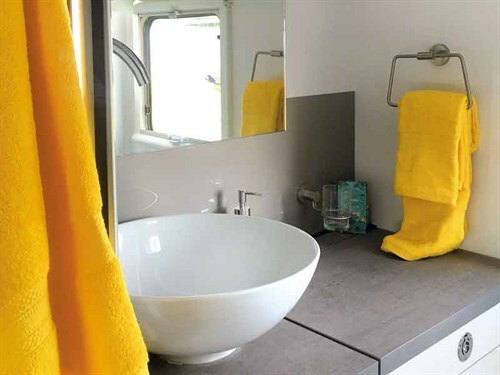 And there are a host of other colours available for both inside and outside the caravan). The kitchen and dining areas flow into the bedroom and on through a sliding door to the bunkroom and bathroom. The kitchen is both practical and good-looking. Not only is the benchtop long, it is deep (840mm) as well. In the middle of the bench is the sink/draining tray with the 3+1 hob array to the left and an extractor fan above. There are three small pullout pantry units—one beside the oven and two beside the 190-litre two-door fridge freezer. Four drawers and four overhead lockers provide storage with four more above the dinette if required. 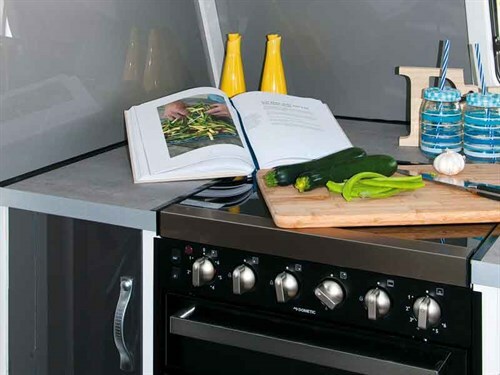 The Samsung microwave sits above the fridge/freezer and the Dometic oven with separate grill is under the hob. Dinette seats can look the part but sometimes are not very comfortable. This one, with its black leather covers, looks the part and its well-shaped cushions offer excellent support. There is plenty of room for four diners and at a pinch, a couple more could sit on the other side on folding chairs. The tabletop forms the bed base when the dinette is converted into a bed. There are two drawers under the dinette seats. The queen-sized bed has all the makings needed to provide a good night’s sleep. With its mattress 1520mm wide and 2000mm long and made from multi-layered memory foam, it should do the trick. Although there is a window at the bed-head end, there is still enough room beneath the window to sit up in bed. Each side of the bed has a small side table and cubbyhole for personal bits and pieces. Clothes and other items can be stowed in the overhead lockers and clothes for different seasons can be stored under the bed. There is more cabinetry surrounding the window at the foot of the bed containing lockers, drawers, and the TV storage cabinet. At the press of a button, the TV rises vertically out of the cabinet ready to be viewed from either the bed or the dinette. There are two small rooms across the back of the Topaz—the bathroom and the bunkroom. The way to the bathroom is through the bunkroom. A sliding door closes off the bunkroom from the rest of the caravan and a second sliding door through to the bathroom closes off the bunkroom. I like the privacy this arrangement offers, shielding the bathroom from the rest of the caravan. The bathroom vanity unit is higher than normal because it houses a Sphere 3kg washing machine. The shell style handbasin mounted on top of the unit is too high for toddlers to use. Toiletries and personal items can be stored below the handbasin or in the locker above. The shower is ‘man size’ with enough room to spread your elbows while lathering up. It has a shelf for shampoo bottles, a fan vent in the roof to clear the air and a novel soft plastic roll-up door that prevents shower overspray from wetting the bathroom. A functional bathroom tidily presented. Although the bunkroom is the smallest room in the caravan, it still offers buyers options. They must decide which bunk arrangement to choose while keeping in mind the bunks, at 1750mm long, are designed for shorter folk. Will it be two bunks or three bunks, one above the other? Or will it be the two-bunk/dinette option where the bottom bunk converts into a two-seater dinette by rearranging the tabletop and seat cushions? No matter which arrangement is chosen, the two large storage cupboards remain, tucked into the corner beside the bunks and the top and bottom bunks each have a window. A ladder is provided for accessing the top bunk. 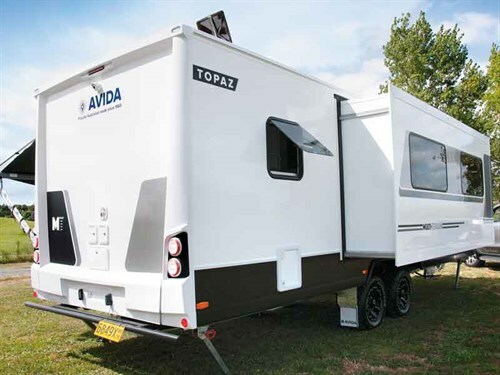 The Avida Topaz CV7656SL caravan is built to cope with serious off-grid exploration inside as well as out, with a large fridge/freezer, two LPG bottles, large water tanks, excellent battery capacity, and a 160-watt solar panel for recharging. Toss in the external barbecue LPG connection and the external hot and cold shower and you have the makings of a wonderful off-grid home away from home. It may look different on the outside but keeping all the bodywork above the chassis eliminates expensive, time-consuming damage repairs. The slide out for the extra room it provides. 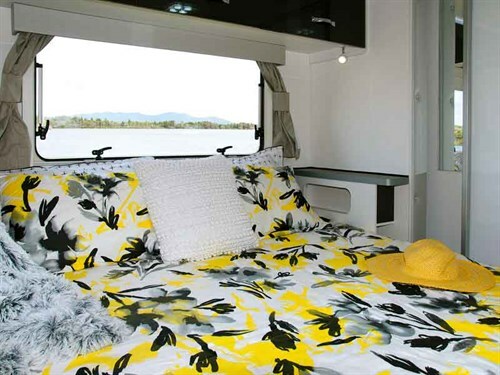 Read more reviews on the latest motorhomes and caravans to hit the roads in New Zealand.